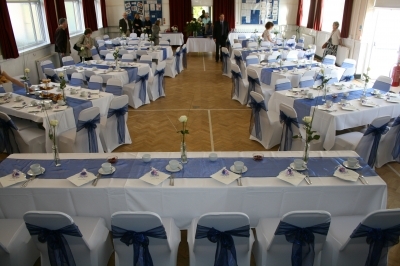 The Len Hawker Hall (pictured above) is suitable for disabled users, and meets all Health and Safety and Legal requirements. It enjoys full central heating and has a modern well equipped kitchen for serving refreshments. A large stage with dressing rooms and toilets is also available. The Mick Arnold Room, is a self-contained area with its own cloakroom and toilet and is available for meetings of up to 32 delegates. This room is also used for craft classes, small sales, and band and choir practice and has a Yamaha digital piano in situ.